CALGARY — Emergency crews are at the scene of a train derailment on a sinking bridge over Calgary’s swollen Bow River, working to keep railcars full of petroleum products from falling into the water. At approximately 3:30 a.m., local time, the train derailed on the Bonnybrook Bridge outside of Canadian Pacific’s Ogden yard. The Transportation Safety Board has deployed a team to the site of the derailment. The federal agency said four of the cars contain petroleum products and one of them contains ethylene glycol residue. A sixth car is empty, according to CP. Crews are stringing a cable through the railcars and securing it to bulldozers on land so that, if the bridge gives way, the cars won’t be carried down the river. Booms are being deployed down river in case of any spills. I am uncertain if this bridge is part of the main east-west CP line across Alberta. If it is, this is indeed bad news for CP, its shareholders, & those who need to ship stuff back & forth across the country. I hope they have a workable detour for their trans-continental traffic. I suspect the flooding river has scoured out the river bed around one or more of the pylons that support the bridge. When they inspected the bridge following the worst of the flood, I don't know if they could really determine whether or not all the pylons are well anchored to the land below the river bed. A river in flood not only gets wider, but it also gets higher, much faster (and hugely increases its scouring power). The river also gets deeper and in an extreme event such as happened in southern Alberta last week can & will undermine bridge pylons & abutments. 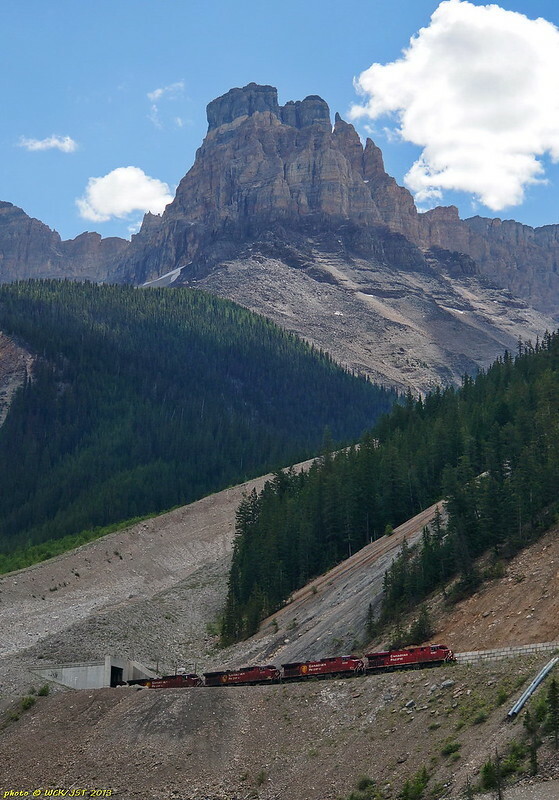 Canadian Pacific west bound mixed intermodal train descending 'The Hill' below Cathedral Mountain on the Laggan Subdivision just east of Field, BC, & west of the lower spiral tunnel - 23 July 2013. The locomotives (five of them) are emerging from a long rock shed that carries the line under a large debris chute coming steeply down from the col between Cathedral Mountain & Mount Stephen. Was this photo taken from Yoho Valley Road, near the overflow campground ? Very close - this was shot from the side of the TCH, just east of the Monarch overflow campground. We spent the night at a walk-in site in that campground. That allowed me to keep an eye on east bound trains going up the hill, and as luck would have it, the Rocky Mountaineer came along just after we finished supper. I 'gave chase', all the way east to Morant's Curve. On my return, I caught another long west bound box train descending its way through the Spiral Tunnels. My wife stayed back at the campsite, preferring to read her book. The rock formation makes this photo look like it was taken in Utah, until you notice the abundance of trees! CPR coal train, westbound at Notch Hill loop, near Tappen BC. - seen by me at noon on September 9, 2013. 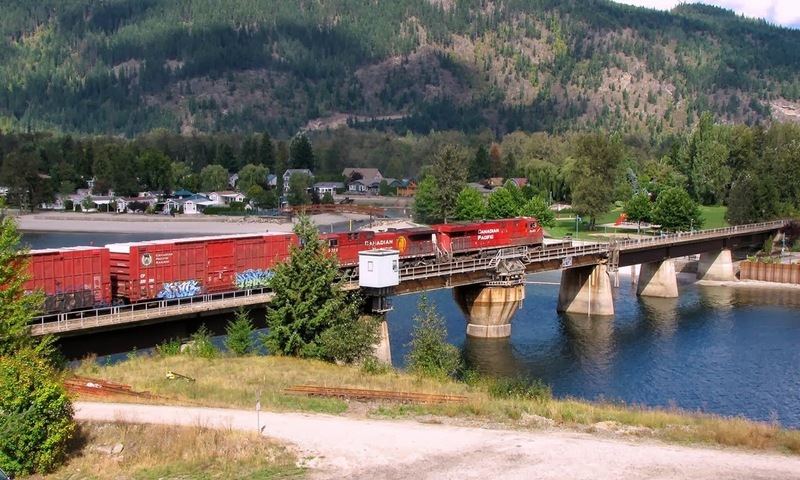 CPR swing-bridge at Sicamous BC, where Mara Lake empties into Shuswap Lake. - I was happy to see the bridge open, when I drove by. I was visiting Revelstoke BC yesterday, and in the evening I was in a park walkway beside the CPR rail bridge (Columbia River). I had my camera/tripod set up, waiting for a train to cross the bridge. 2 ladies walked past me, and asked if I was waiting for a train. We chatted a bit. - within 2 minutes, both had mentioned Mr. Hunter Harrison, in a non-loving fashion. And it wasn't just a passing mention. The Hunter Harrison topic continued among them for a few more minutes, even speculating how his wife could stand being married to him. In a small town with 1 key industrial employer, feelings are strong. According to some, he makes money by not spending it, even when it's necessary to do so, with the result that the railway falls into disrepair while it appears to be making money. CN apparently had some lines that were on the verge of abandonment from simple lack of maintenance due to Harrison saving money while he was CEO of CN. Hunter Harrison is the model if everything wrong with the Western world's economies. He treats people very poorly and allows infrastructure to crumble. He has exported and eliminated thousands of jobs. CN is now entering the phase where more expensive recapitalization is required because of neglect to infrastructure - ironic given it occurred during the railways most profitable period, ever. Service reductions to small industry are having massively negative effects on CN lines, and now it has started at CP. His success is an embarrassment to common sense. Yes, I am now processing many of my train videos that I shot a few weeks ago. Here is my visit to Clanwilliam tunnels, west of Revelstoke. A lovely location with 3 tunnels in a row. The rail is on the far side of a narrow lake from the highway. 3 different eastbound CP trains are shown in this video, from September 9, 2013. Here is what I saw at Sicamous, BC. Afternoon of September 9, 2013. When I drove into town across the R.Bruhn highway bridge, I noticed that the CPR swing bridge was open. So I quickly found a place to park, walked back over the bridge to a good-view spot, and did some filming of the bridge. Some stills from my time at Clanwilliam tunnels, in the afternoon of Sept.9, 2013. - at the far end of the lake, hidden by trees, is the new Clanwilliam Overpass 4-lane highway bridge. Train seen in 2 different gaps between the tunnels. - Hey, I put a bit of thought into my photo vantage point, so as to see both gaps. - video includes an explanatory chat by myself, and then the passing of a westbound coal train. Awesome videos and still shots! Thanks for posting them. There is better rail shots here than on the Yahoo groups sites. Thanks for those words. Much appreciated. I agree with your assessment of our forum's trains thread. When I was planning my recent trip, I used the photos and comments of this thread to get ideas for locations and for shot composition. I've learned lots about trains from this thread; still lots for me to learn. Here are some still photos of my visit to Notch Hill loop, on the CPR line, near Sorrento, BC. - Sept.9, 2013, when I saw a westbound coal train passing through the loop. The start of the loop is this culvert under the road (Notch Hill Rd., of course). - the end of the loop is a bridge above the road; hence the elevation gain, which is the loop's purpose. The head-end has already started the turn. The tail pusher locomotive, seen from the start of the loop. - When I'm watching and hearing a coal train passing by, it's always easy to know when the mid-train pusher and the tail pusher locomotive are getting near, because you can hear the engine humming before you see it. The head-end in the far end of the loop. - lots of corn in the middle. Climbing the hill towards the road bridge. And the tail-end locomotive is crossing that bridge. My imperfect pano-stitch of the entire loop, seen from the far end of it. 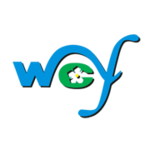 - accessed from Greer Rd. I agree. I tend to stay away from yahoo groups for trains except for modelling specific ones. But there are Train forums out there that bring in photos from all corners of the galaxy. However, if you ever thought ferry nuts were a raucous bunch, that's nothing compared to some train forums where there really are some people with permanent knots in their shorts. They could probably even outdo a transit forum on a good day. Some stills from my passing-through visit at Sicamous, BC, in the afternoon of September 9, 2013. Shots that I've taken from the sidewalk of the highway bridge, of the CP Rail swing bridge. - the bridges are over the outlet from Mara Lake into Shuswap Lake. - open for large houseboat water traffic, closed for rail traffic. The closed bridge, with an eastbound CP train on it. CPR bridge at Revelstoke, BC, on the Columbia River. - seen in the evening of September 9, 2013. If you want to see and hear what it's like to be under the bridge when a train crosses, then check this out. 2 different trains, seen by me on same evening at Revelstoke. I'm on the park walkway that runs along the east side of the Columbia River. - just 3 antique cars being moved across the river. I posted a video of this, a few posts back in this here thread. For my September rail-photo trip, this was probably the closest that I got to a train. I was looking at the video, and that looks to be CP's track geometry train. The middle car has special sensors that measure for curvature, proper gauge, alignment and uneven rail wear to determine which areas of track require maintenance. We've got lots of CP posts already from Kamloops eastward, so here's the thread for it, and for future items. Morant's Curve, Spiral Tunnels, Rogers Pass, etc. A Byron Harmon photo from 1921. - Nicholas Morant was 29 years old when this photo was taken. Mr. Morant started his career as "Special Photographer to the CPR" in 1929.